Site Details is only available to Full Access users. This is used when you want to include a link that appears on the login page, right underneath the username and password fields. In this sample, the link is called 'Login Help' and brings the user right to the Log In/Log Out section of the Wiki. This information appears on the bottom of Curriculum pages. This link is displayed as a circle with a question mark in it in the upper right corner of the login screen when your mouse hovers over. This feature can be turned on or off on the Site Details, under the A tab (Full Access required). By default, it is unchecked, therefore off. 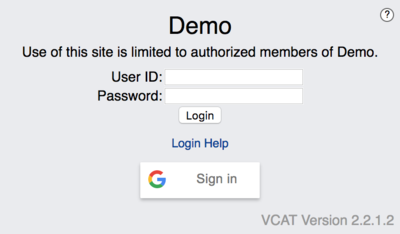 In order for the Google Sign-In feature to allow a staff to gain access to VCAT, the email address associated with the staff account in VCAT must be the same as the one used for the Google account. This field allows you to create a custom banner across the top of the public curriculum access site. You may use HTML tags and can define custom css within css tags. There is also a preview of the public curriculum banner right below the field. You can view a sample of a Public Page below. 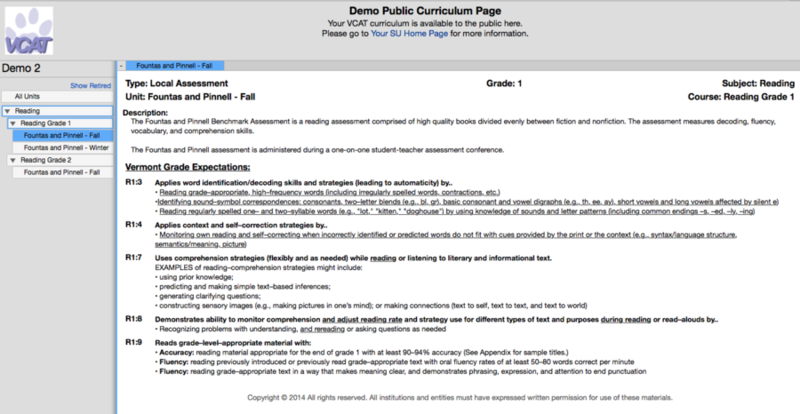 The curriculum made public is listed on the left and only gives access to the Curriculum page of the units. Public Access is granted under the Develop tab. When you grant public access at a Folder level, all the curriculum courses and units within that folder inherit public access. Select the Folder, click on the top bar where the Folder name is written in bold letters to get the drop-down with Public Access details, click on the radio button in front of Current Versions, and hit Save at the bottom left. When you grant public access at a Course level, all the curriculum units within that course inherit public access. Select the Course, click on the top bar where the Course name is written in bold letters to get the drop-down with Public Access details, click on the radio button in front of Current Versions, and hit Save at the bottom left. When you grant public access at a Unit level, only the curriculum unit itself is given public access. Select the Unit, click on the top bar where the Unit name is written in bold letters to get the drop-down with Public Access details, click on the radio button in front of Current Versions, and hit Save at the bottom left. Public Access can be removed at a Folder, Course, and/or Unit level under the Develop tab. Removing access granted at a Folder level will remove access to all the courses and units within that folder. Removing access granted at a Course level will remove access to all the units within that course. Removing access granted at a Unit level will remove access to the specific unit. If you wish for only some courses and their units to have their curriculum pages public within the same folder, you can adjust the access at the course level. If you wish for only some units to have their curriculum pages public within the same course, you can adjust the access at the unit level. Select the Folder, click on the top bar where the Folder name is written in bold letters to get the drop-down with Public Access details, click on the radio button in front of None, and hit Save at the bottom left. Select the Course, click on the top bar where the Course name is written in bold letters to get the drop-down with Public Access details, click on the radio button in front of None, and hit Save at the bottom left. Select the Unit, click on the top bar where the Unit name is written in bold letters to get the drop-down with Public Access details, click on the radio button in front of None, and hit Save at the bottom left. 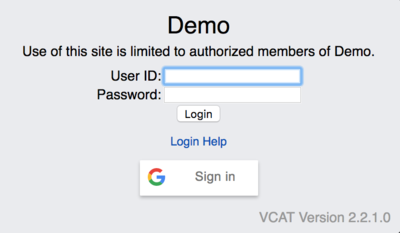 To access your public curriculum, type in vcat.us/yourVCATsite/public (like vcat.us/demo/public for the Demo site). You can access any SU/SD's public curriculum by typing vcat.us/SUVCATsiteNameHere/public. This page was last modified on 13 March 2018, at 17:26.